Mound forming alpine with rounded, densely packed rosettes, slightly larger than the species at up to 3cm across. 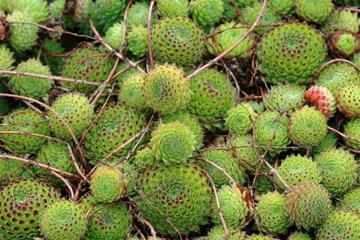 The numerous succulent leaves are pale green with brownish tips. Offsets are very freely produced on long stolons up to about 9cm. The flowers have no petals, only sepals. Best in full sun and on poor, sharply drained soils. Very drought tolerant and will survive in positions where not much else will grow. Will root into very small crevices, but may need to be secured until established. This form is easy to grow and withstands winter dampness better than most.